Do you want to watch a movie that brings out the Spirit of Christmas perfectly and fills your heart with nothing but good feelings? Mr. Krueger’s Christmas is exactly what you’re looking for. 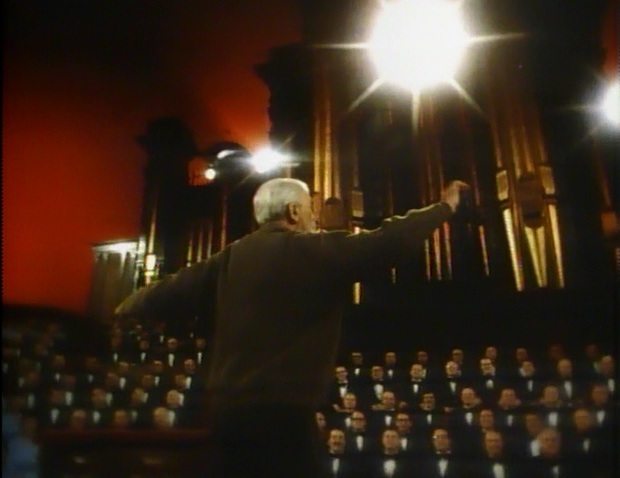 This little 26-minute, made-for-television musical drama is notable for making frequent use of the Mormon Tabernacle Choir and for casting James Stewart as the titular character. Stewart is, of course, famous for his portrayal of George Bailey in It’s a Wonderful Life. I would argue that Mr. Krueger’s Christmas is right on the same level as that film in terms of its emotional impact. Let’s settle in and spend a heartwarming evening with Mr. Krueger’s Christmas. 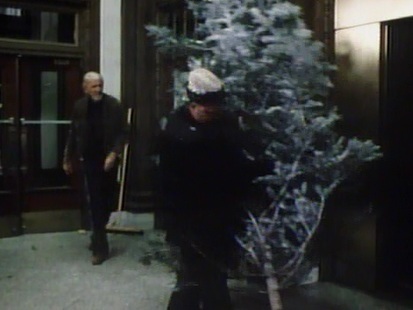 The film opens with Willy Krueger sweeping a lobby when a man with a Christmas tree enters and heads for the elevator. He apologizes for leaving a mess of pine needles on the floor, but Mr. Krueger says he’s happy to sweep a second time for a Christmas tree. Instantly this makes me love this character. He’s a sweet old man, a hard worker, and he loves Christmas – all great qualities. Most of this film takes place in Mr. Krueger’s apartment where he talks to his cat and muses on surprisingly deep topics. Despite the simple setting, this movie is never boring. Stewart’s performance is so captivating, I wish the film was longer so I could spend more time with his character. A lot of things happen under the surface of this film. It doesn’t have much time to establish characters, so it does something inventive: it shows Mr. Krueger’s daydreams about the people he meets so that we not only get a glimpse into how he sees the world, but we also see the people he runs into in the best possible light. For example, when he meets some carolers, he sees them as a glorious group rather than the somewhat ragtag bunch they are in reality. Even when we see them for who they really are, we can’t shake the image of them as masterful musicians. Mr. Krueger fantasizes about being more and doing more than his humble means allow. A scratchy Christmas tune on his old record player magically transforms into the Mormon Tabernacle Choir, with Mr. Krueger as conductor. His puny Christmas tree becomes a 20-foot-tall tree filled with beautiful ornaments and lights surrounded by dancers and singers galore. And a Nativity Set becomes the real thing. 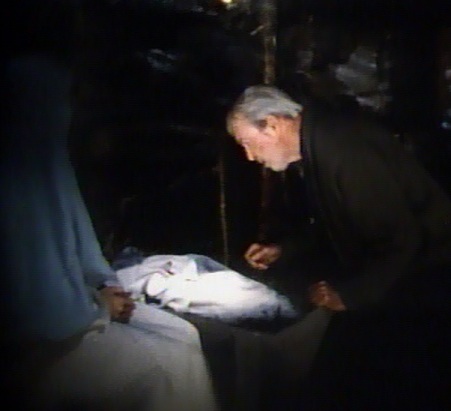 The best part of the film isn’t the well-choreographed musical numbers, but a quiet talk that Mr. Krueger has with the baby Jesus. While looking at his Nativity Set, Mr. Krueger’s imagination sends him to that quiet stable in Bethlehem where no one but the baby can see or hear him. This is so perfect because throughout the course of the film people have passed by him without accepting his invitations to have a nice conversation or become his friend, but now we see that the Lord has been paying attention to him the whole time, however silently. Mr. Krueger pours his heart out to the child, thanking him for helping him through his wife’s death and in those times when he needed a friend. And then he says something that is so beautiful I don’t think I’ll be able to do it justice. He tells the Lord a story of how an old woman broke a pipe in her apartment just to have an excuse to get him to visit her. At first he was angry, but he realized she was just lonely. So he became close friends with her, and he treasured the time he spent with her until she died. The way that Stewart tells that story is so moving that I feel like I know that woman, and I am so touched by Mr. Krueger’s efforts to help people like her who are worse off than him. He is a good man, and that is all he wants to be. After telling his amazing story, Mr. Krueger then tearfully thanks the Lord for every good thing in his life. As he does this, he returns to reality where he is rewarded for his faith and kind deeds by finally being invited to come caroling with some friendly people. He is so excited to spend Christmas with friends that he can hardly contain himself. It’s the perfect ending to a sweet story. 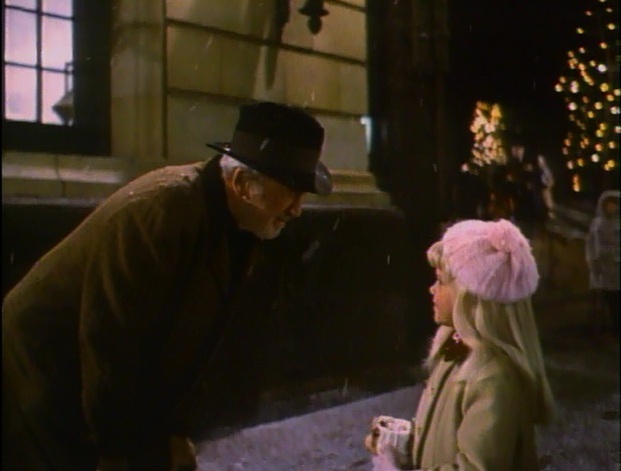 A voiceover even tells us that love, like the kind that Mr. Krueger found, is what Christmas is all about. Watch this movie right now and prepare to be amazed by a subtle and affecting performance by the late great James Stewart. The music, visuals, acting, and story all come together to create a superb piece of entertainment that you can enjoy any time of the year to feel the Spirit of Christmas. I love this movie! This entry was posted in Forgotten Film Gems and tagged christmas, drama, films, holiday, james stewart, jesus christ, movie review, movies. Bookmark the permalink. There is nothing terribly wrong with any of this, and sometimes in ”Mr. Krueger’s Christmas” -produced by Bonneville Productions – we see traces of the famous Stewart charm. On the other hand, ”Mr. Krueger’s Christmas” has somewhat the look and feel of a home movie. The other characters all appear to be members of the choir, hastily drafted for the film. Thank you for your comment. I agree that the film does come across as small in scope and not terribly ambitious. I didn’t like it too much as a kid because it lacks a lot of qualities of other films. But I think it makes up for its production quality and deep story by solely focusing on Mr. Krueger and telling his simple story in a beautiful way that melts my heart every time. Even if the acting isn’t perfect from all the players, it’s serviceable and you can tell they’re putting forth a solid effort. Thanks again! I am ashamed to admit that i just watched Mr. Kruegers Christmas a few days ago after a friend from a Yahoo CHristmas group recommended it to me. I enjoyed it a great deal, it is only 25 mins but you feel like you know Mr. Krueger and can feel his happiness and his frustration. I wish this would get more TV airing during the holidays. It’s not Christmas in my house until I watch this sweet show!